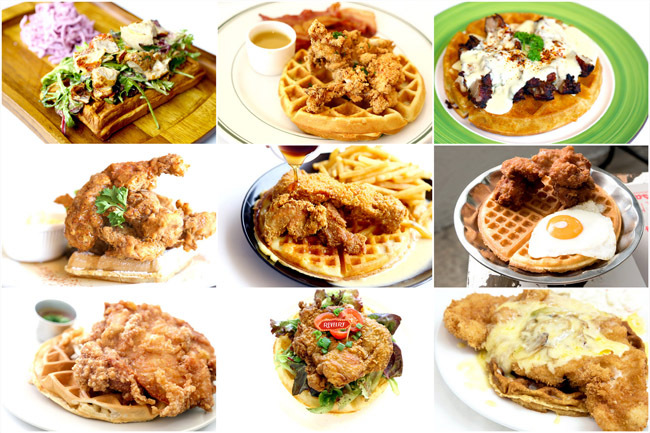 10 Chicken Waffles In Singapore, Including One That Is $4.50! Yes, $4.50!! 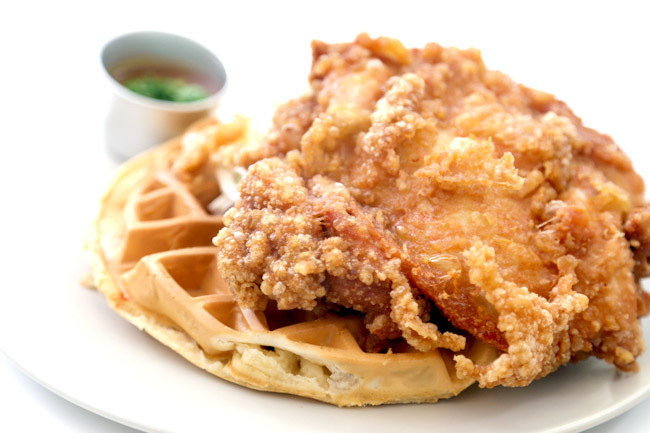 Soul food Chicken and Waffles has been gaining some popularity in Singapore. But the calories. Oh, plus the maple syrup and butter. 5 km of jogging ain’t going to help burn that much. 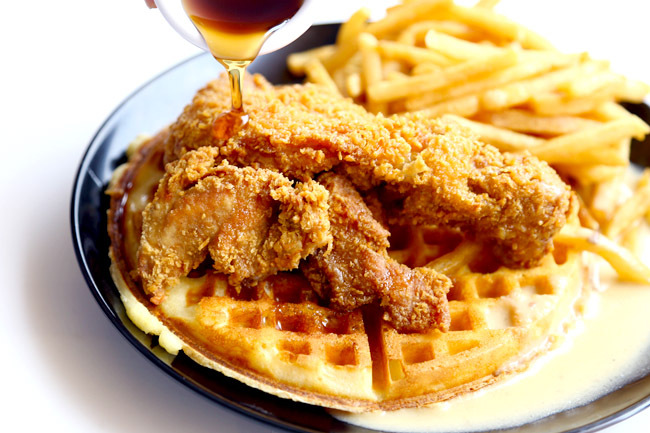 Here are some 10 Chicken Waffles in Singapore that we tried and tested, some worth its money (calorie is a separate issue, because not everyone can afford). Some you can well, wait till you have a bad craving. Truly. A $4.50 Chicken Waffle. $4.50! We couldn’t believe it ourselves. We also didn’t know how we ended up asking the Truly Curry Rice shop owner Joel if he sold Chicken Waffle. Weird, strange, but he did. He wanted to keep cost lower for his loyal customers, acknowledging that this canteen is hard to find, on the 7th level of Jun Jie Industrial Building. While the waffle was too soft, drenched in a weird buttery sauce and fries oily, we didn’t have much to complain about the juicy deep fried chicken. Truly a hidden find. 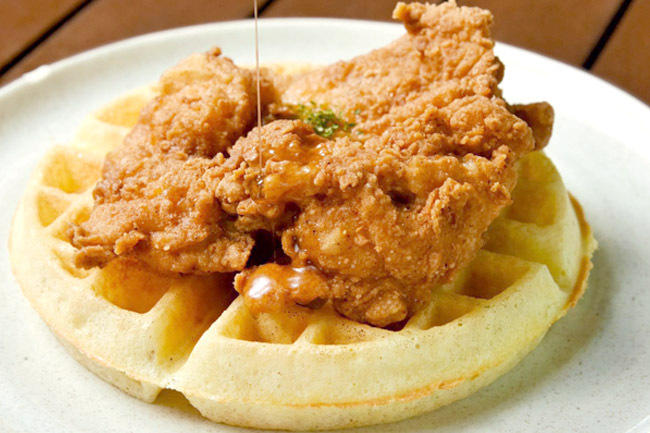 Sin Lee called their Fried Chicken & Waffles ($21.90) “The One & Only”. To be fair, the iron waffle base was so much better than many other cafes which try too hard to push another waffle item on their menu, perhaps because one of the co-owners owns a crepe shop. This is what I would call “delicious grub food”. The deep fried chicken leg meat laid on top, all tender and moist, could feed two hungry men. If only it was less salty. And fortunately, the house slaw at the side helped ease out the greasiness. 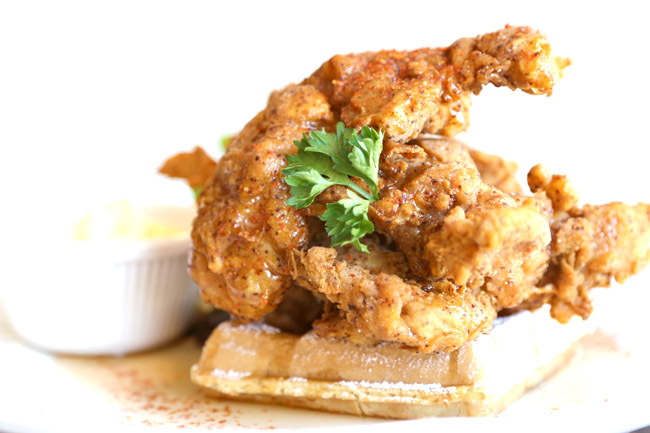 The Beast’s Chicken and Waffles ($20) contains signature fried chicken with waffles and housemade bourbon maple butter sauce. The chicken comes in a big slab and is flavoursome, though the waffles are airy and plain (A friend mentioned about a “weird yeast taste”.) The alcoholic sauce is one of a kind. This is called Stinky Meets Crispy ($22). Serious. Popup shop’s Lazy Susan ‘Stinky’ Har Cheong Gai chicken meets ‘Crispy’ rice flour and sambal maple. 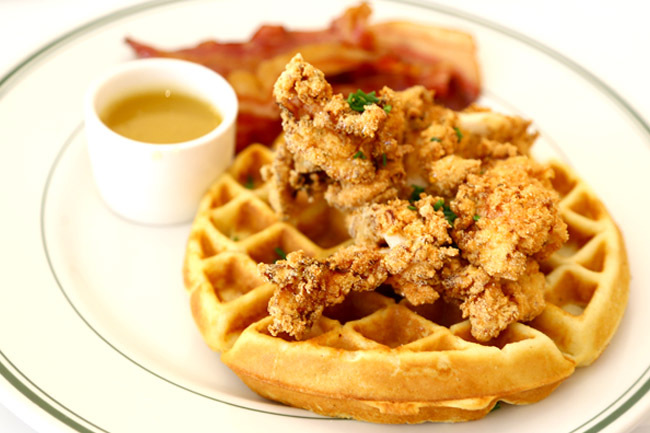 Chicken & Waffles ($16) with crispy chicken thigh on waffle served with maple syrup on the side. 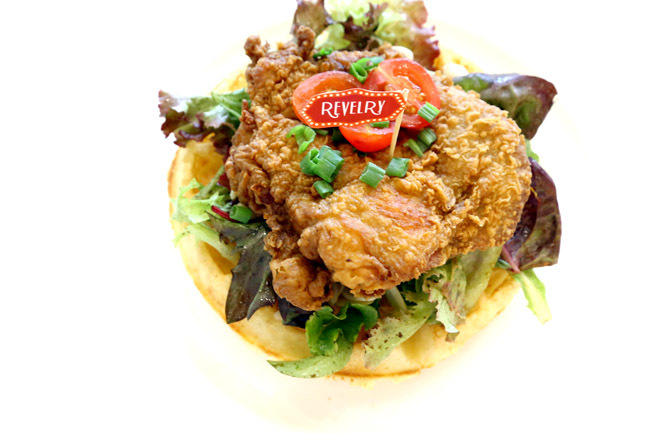 Instead of the usual buttermilk waffles that were much more chewy and dense, Revelry’s version was crispy and light, with a texture in between the old-school ice cream wafers and youtiao (I thought). There were loads of air pockets, and thus you would not feel so full after dining. While I did like the waffle texture, the chicken could be juicier and flavourful. Chicken & waffles ($21) by Clinton St Bakery. 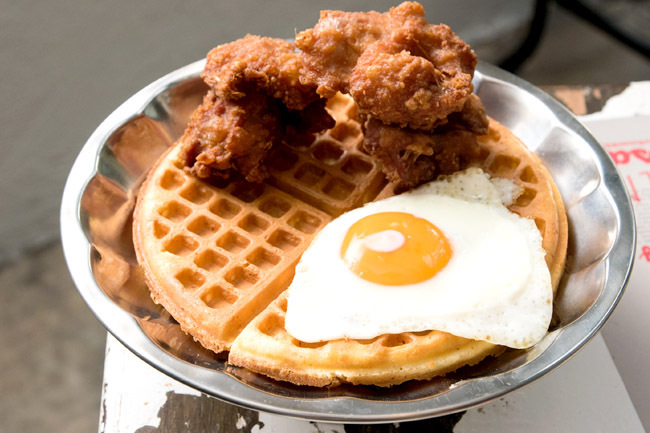 The buttermilk fried chicken was small a portion, occupying a third area of the waffles, and the waffles itself was rather one-dimensionally flat tasting. The breast meat marinated with buttermilk for more than a day, was regrettably dry. While looking around at spoils of other table, we also noted one or two pale, untanned chicken. 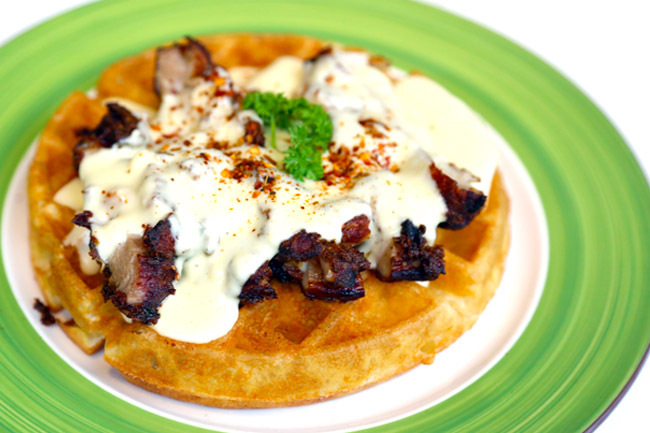 Considering how widely this is raved, we were slightly disappointed with the Belgian Waffle & Fried Chicken ($17) which comes with a classic cheese sauce. While we liked the light waffles and the sauce, the fried chicken was way too salty for us to completely enjoy. Perhaps it had seen better days. Arteastiq’s Chicken and Waffles ($22) had an Asian twist. 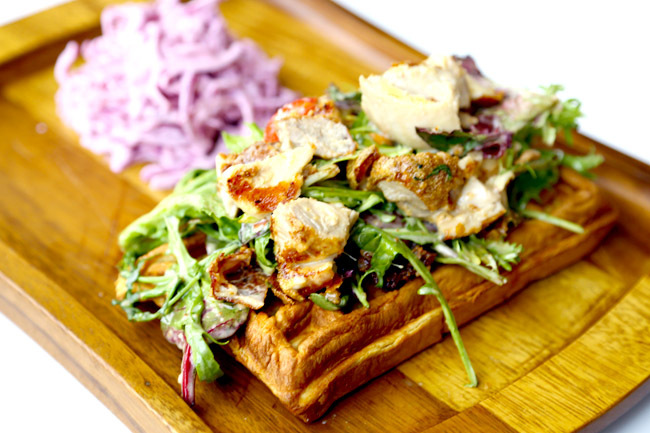 The buttermilk chicken was pan-fried, then tossed with red onions, cashew nuts and Thai mayonnaise. So rather than a slab of chicken, you get pieces on top on the waffles, though they tasted quite dry and plain. If you are also wondering why the waffles would taste healthier than the usual, a whole-wheat version is used. 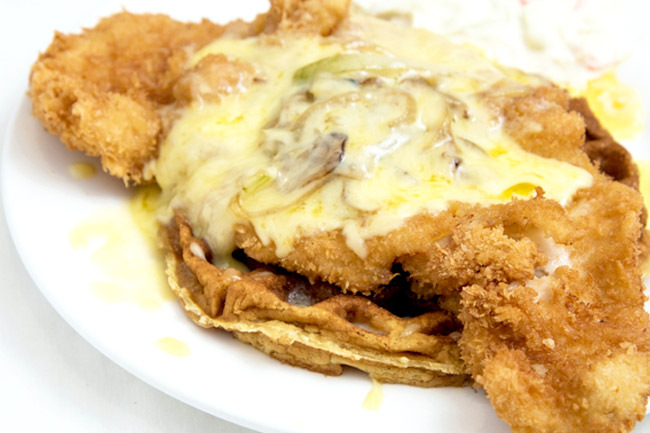 Buttermilk Chicken Waffle ($12) served on plastic plates similar to that in food courts is likely not to appeal to them. The shimmering golden brown, crispy fried breaded crust chicken with melted cheese and caramelised onions looked promising. BUT, the fried chicken was dry (again) and waffle soft and limp. Not many may know that Swensen’s sell a version of the Southern Style Chicken Waffles, drizzled with honey, served with buttered potatoes, creamy mushroom and sausages. Standard could differ branch to branch though. * Eaten, I mean written by Daniel Ang @DanielFoodDiary. Some photos provided by Nicholas Tan @stormscape.